Modern Art Oxford is soon to unveil its fourth exhibition ‘It’s Me to the World’ in KALEIDOSCOPE, a celebration of 50 years as an internationally acclaimed gallery. The latest iteration will feature works by Marina Abramović, Mohammed Qasim Ashfaq, Dorothy Cross, Richard Long, Agnes Martin, Otobong Nkanga, Yoko Ono and Hannah Rickards. But the work ‘Walking A Labyrinth’ 1971, by artist Richard Long is already accessible for viewers to explore before the show opens on 20 August. 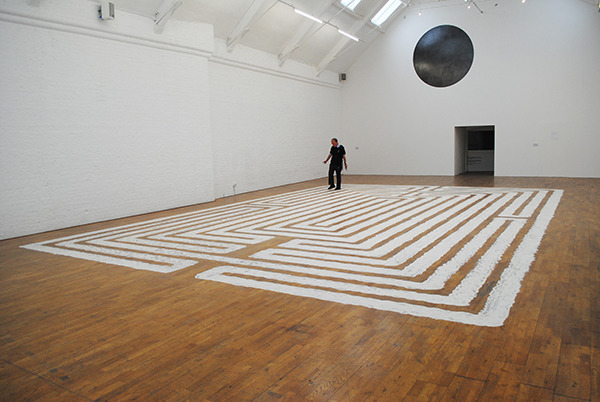 Image: Richard Long, Walking a Labyrinth, 1971, KALEIDOSCOPE: It’s Me to the World, Modern Art Oxford. Photo P A Black © 2016. 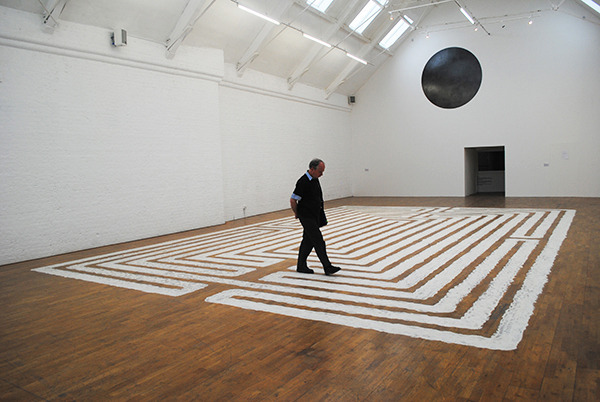 The artist’s installation ‘Walking a Labyrinth’ was first created for Modern Art Oxford in 1971. The work is an enormous rectilinear maze-like ‘floor drawing’ made from earth, it invites visitors to walk along its miriad of paths. 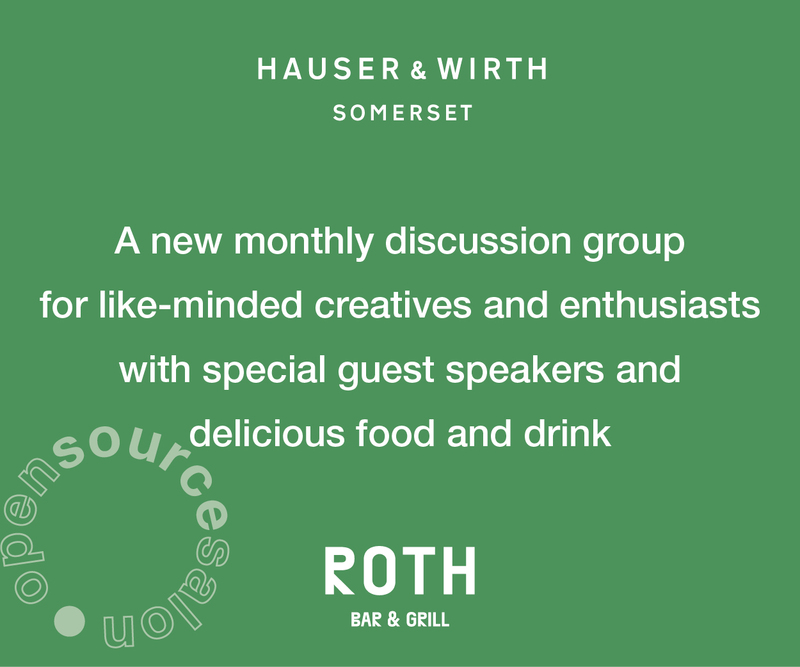 The piece is one of the artist’s first large-scale interior installations, and creates a relationship between viewer, the materiality of the natural world, and interior and exterior environments. Rising above Long’s labyrinth is a new site-specific drawing by London-based artist Mohammed Qasim Ashfaq. The artist’s drawings and sculptures draw on the traditions of Islamic art and 20th century western modernism, and the artist’s current work is a vast black circle of dense charcoal drawn directly on to the gallery wall reflecting light from surrounding skylights, blurring the distinctions between, drawing, sculpture, and installation. KALEIDOSCOPE is a year long series of interlinking exhibitions, performances and events, celebrating 50 years of Modern Art Oxford as an internationally acclaimed centre of contemporary visual culture, reflecting on some of the great moments in the gallery’s history as iconic works from the past return to the gallery from across the globe, shown as part of a dynamic programme of new commissions and performances by acclaimed artists of the current generation. 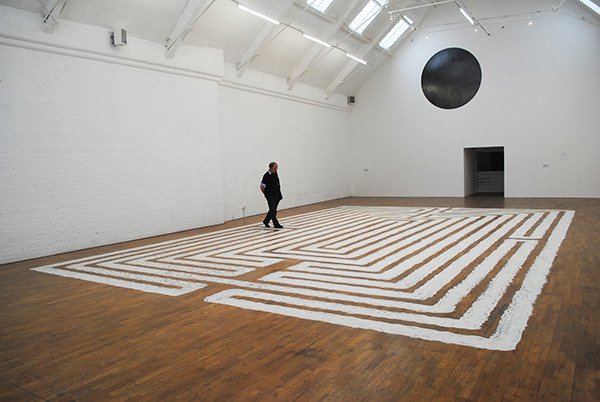 ‘Walking a Labyrinth’ is a typical Richard Long journey, an action taken out of the landscape and in this instance placed in the white cube of the gallery, so enjoy the artist’s historic interactive installation and take a walk.